I thought this would be a good place to put some of my thoughts, things that happened, and a few images that I like but just cannot figure out which blog post they should go in. I will add new entries at the top of the pages each time and date them, so if you visit here every once in a while, you may find something new. If you are subscribed to my posts by email, you won't receive notification when I add something here, so you'll just have to visit the page every once in a while. As I am sitting writing blog entries in the peaceful restaurant at Posada Santa Barbara I hear the band in the nearby pueblo of Chinchera. The music and dancing there has been going on for three days! This is one of the many carnival seasons in the Altiplano. While walking in the countryside two days ago, I came across this fiesta in a small gathering place. The women were dancing the same dance I saw at Candelaria, swishing their full skirts and petticoats back and forth. It seems they can dance like that for hours. I watched from afar for a while and enjoyed listening to the music as I walked back to the posada. Indeed, I can hear it from here day and night. They begin about 9:00 in the morning and are still going strong until about 11:00 pm. There is a little dirt road that runs below my windows. Two nights ago, at about 2:30 am, two or three men walked by on the road singing their hearts out in an Andean melody. They were apparently returning from the carnival that I had passed earlier—probably a little tipsy—but they certainly were happy. Then, last night, about 2:00 am, came the fuegos artificiales (fireworks), again from the road outside my window. Kind of fun, but I was glad it did not last for hours!! I am discouraged—though I know it will pass. I woke up this morning not wanting to go out. I m tired and have very low energy. I’m not really dizzy, but any exertion can make me a bit light-headed. I know it is the altitude but I guess I had thought that since I had already been up here a couple weeks ago that I could just hit the ground running. HA! Think again, Cathleen! Later: As it turned out, I am glad that I laid low for the day. I felt much better the next day. I spent some time knitting in the arched mirador (overlook) right next door to my room and thinking about how fortunate I am to be knitting in such an exotic seat overlooking Lake Titicaca! March 1: Estoy en Chucuito! Otra vez! 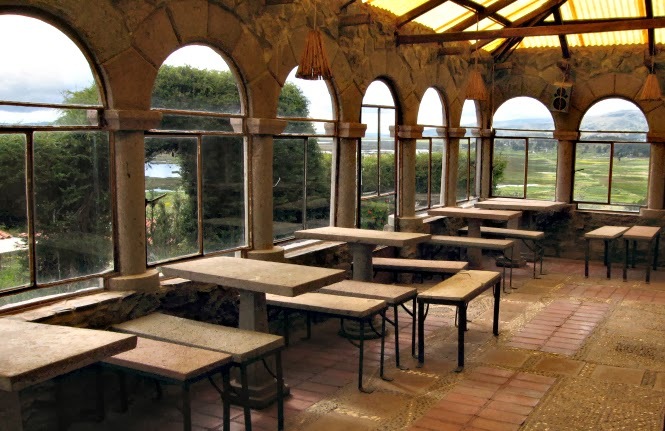 As planned, I arrived at the Posada Santa Barbara in late afternoon—this time planning to stay 2 weeks to a month. Juan was here to welcome me. After settling in my room, I tried to rest a bit before dinner, but really could not sleep. My mind was so busy. It seems like right after I get to a new place, I get a feeling like, “Now why did I come here? What am I doing?” I guess it is the feeling of being outside my comfort zone again. At least from experience, I can deduce that I will settle in and figure it all out. The Cruz del Sur buses have attendants, serve food (of sorts) and play movies. (I think that is mostly to keep people in their seats.) If you are travelling in first class, you get to choose the movie you see. In the upstairs seats, you watch whatever the bus company decides to play. Sometimes the movies are in Spanish with English subtitles, sometimes the opposite. However, Pearl Harbor was playing on my first trip to Puno and the movie started out in English with Spanish subtitles and near the end switched to dubbed Spanish with Spanish subtitles! It was pretty surreal to be travelling through the Altiplano and trying to absorb the scenery while loud dogfights were going on inside the bus. On this to Puno, I decided to travel first class downstairs, and wanting some escape, I decided to watch The Best Exotic Marigold Hotel again. It turned out there were some lessons there for me regarding accepting new cultures, approaching the last decades of your life, and change. I really enjoyed Evelyn’s (played by Judi Dench) blog entries, that she sometimes narrated over the scenes, when she talks about being older and the changes that have to be made in your life. And I liked it that, although she was a woman who had pretty much left life decisions to her husband, she was able to step out of that role and accept the changes that had to be made and go out and experience life! February 25: No Right on Red! Gracias a Dios! I went for a long walk in the city today and during the walk it was exciting to feel like I knew where I was going and what I was doing. 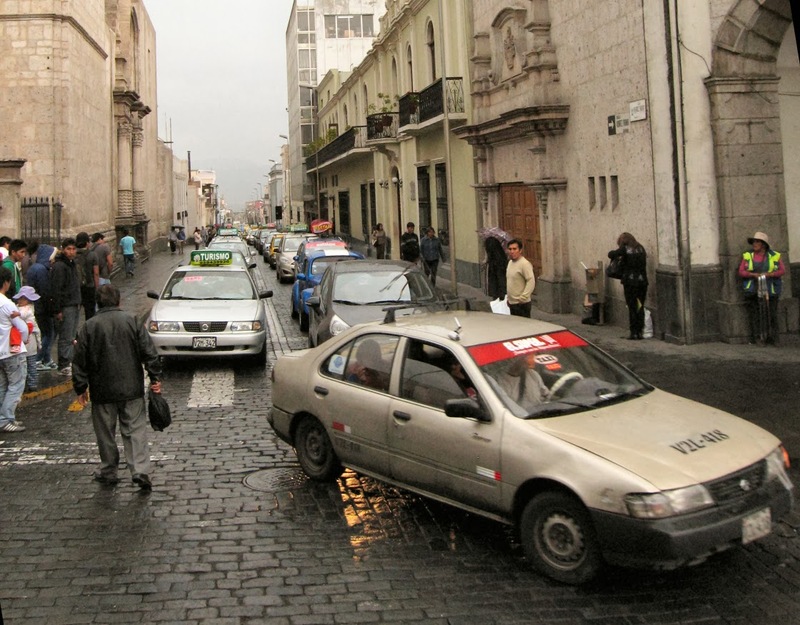 I have gotten more and more familiar with Arequipa and am confident in finding my way and crossing the street like I have lived here a long time. I have come quite a way since January 18! I AM glad, I thought today, that they don’t allow right turns on red lights here! The cars have enough (bastante!) right of way here! February 24: Back to School! Walking through the streets—they are particularly busy this Monday. It is apparent that school is starting soon. There are lines in the school supply shops and young people are seen leaving the Institutos Technicos with matriculation papers in their hands. Fro Peruvians, this marks the end of summer—fall begins soon, although the weather changes little here, no matter what the altitude because we are so close to the equator. It is so surreal to ride in a bus with a panoramic view of Peru’s Altiplano and the movie, Pearl Harbor, is being shown with audio blaring from the speakers. The movie is in English with Spanish subtitles, but sometimes there is some kind of glitch in the editing and the characters suddenly start speaking Spanish! Cruz del Sur has relatively luxurious buses for traveling throughout Peru and South America; and despite what I am about to tell you, they have a good safety record. I had a first class seat on the 16-hour overnight trip from Lima to Cuzco three weeks ago. The first class seats are downstairs and they are quiet and each person can choose to listen (or not) to the movies being broadcast. But in first class, you don’t get the panoramic views that are available in the cheaper seats upstairs. If you get an early reservation, you may be lucky enough get the very best views in the front seat. Of course, there are pros and cons to everything in life: being in the very front affords you the opportunity to see all the close calls and tricky passes that the driver makes. I think we actually bumped into a moto-rickshaw in Juliaca. Not for the faint of heart! And we passed this little “dint in the road” village on the way to Puno. Look! Crossing the Rio Chili in Arequipa, I came across these locks on the bridge. Think about it: are the keys in the river? How romantic! I thought this walk-light was so funny, I just had to share a video of it. I think we need these in the US! Oh my brain is tired! Blanca, Manuel's sister came up before dinner and as I was sitting at the table knitting, she sat down next to me and started talking "80 miles a minute" in Spanish like she assumed I understood everything she said. (She knows how poor my Spanish is, but I think she likes to talk, or maybe she is surreptitiously teaching me.) Occasionally I would get the gist of what she was saying and would make some comment in English about it, or I would stop her at some word and try to determine what that one word meant--even though I could not understand about 95% of the other words. Sometimes I would tell her the English word for what she was talking about. For example, after a long discussion, I figured out that she was talking about springs. I said, "el lugar donde agua sale de la tierra?" ("the place where water leaves the earth?") She said "Si," so I told her that the English word was "spring." She said, "Primavera?" (as in the season of spring), which launched us into a completely different conversation about how some words have many meanings. Blanca stayed though dinner and the lingering time afterwards sitting next to me the whole time. It was interesting that she talked about so many different things, like she assumed I understood it all: wetlands, the coastline and beach nearby, her sister's condo that she had just visited in Mollendo, the political and economic situation in Argentina (I got almost none of that part! ), the German population of Chile and Argentina, dams in Peru, Egypt, and the US (where did that come from?! ), the wealth of Dubai and the palm shaped islands they have constructed in the Persian Gulf (I actually knew about that one! ), and much more. When Adela, Manuel, and Mechel joined us, they were able to "help" me listen and understand. I had purchased some delicious organic dark chocolate near the Plaza for dessert and that launched us into yet another conversation about dark and milk chocolate and which types we prefer! Later, Larry, another guest from, of all places, TACOMA! !, arrived and sat down for a cup of tea. Larry speaks very little Spanish and so I got the most rewarding opportunity to "translate" some of what Larry said into very broken Spanish. What fun that was! It was all excellent practice and I felt like I held my own fairly well, even though after about two hours, I could really feel my brain getting very tired! Today, Manuel and Adela invited me to accompany them on their errands. They needed to get a battery for their cordless phone, so we went to (guess where!) 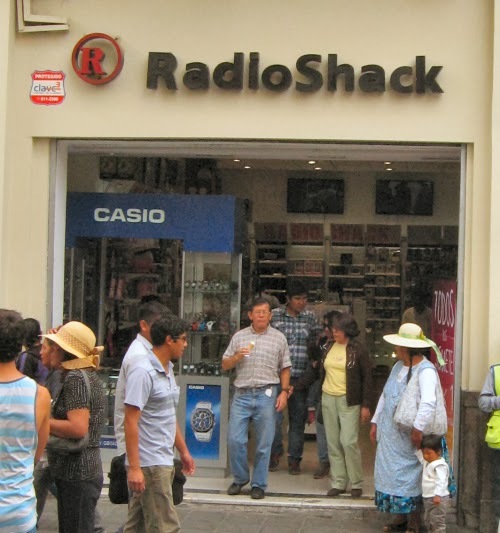 Radio Shack! It is located in what must be a very high rent space--right on one of the corners in the busy Plaza del Armas. I got this shot of them as they emerged from the store--unfortunately without a new battery. On Monday, when Adela and I were in the central Plaza de Armas and it was sprinkling a little, there were people--sometimes 2 or more on each corner, and mostly women--selling paraguas (umbrellas). They called "Paraguas! Paraguas! Paraguas!" capitalizing on the weather. I had jokingly remarked to Adela that if the sun was shining the next day, they would be selling sun hats. Well, I ws not very far off. At dinner tonight, she and I laughed when I told her that since it was sunny today, they were selling lentes del sol (sunglasses)!